I don’t know exactly what they’re called, but I hate those new Facebook auto-bot-stupid generated pages. No one creates them, they’re just generated by Facebook around a term or idea and it auto–bot-stupid aggregates content around the topic or idea and it auto-bot-stupid suggests to folks (who are neither bots nor stupid) to like the page. Long ago I submitted the official page for the auto-bot-stupid page created for C3. But has it changed? No. And there are 5 people who like it who I’m not sure if they’ve found their way to our actual page. This shows just how auto-bot-stupid it is. Hmmm… Judging by the images, there are 2 different pages on the same word. Curious, I click through to the first one (names intentionally blanked out). Which appears to be intentionally created by someone. 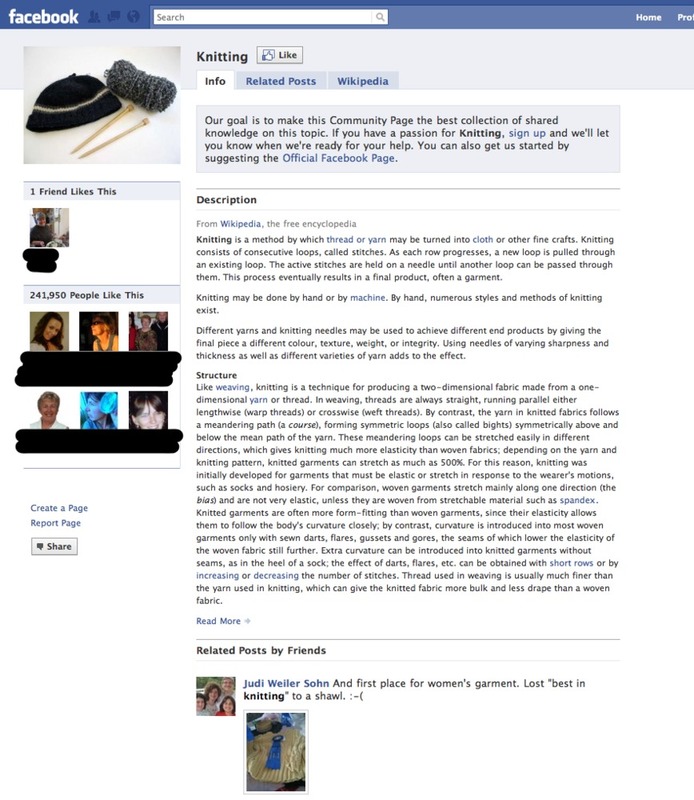 So a page is created for Knitting. and a separate auto-bot-stupid one for Knitting (notice no punctuation)? Great, tomorrow will Facebook suggest me to like Knitting? How about Knitting! I love when I get a recommendation to a real page based on what I’ve already liked. Great idea. But these auto-bot-stupid things have got to go. Next Post iPad: strange redirect bugs?